This was part of my very frustrating conversation with my doctor in the middle of March. I really like this doctor by the way. And I do trust him. He delivered our first son, and was my doctor for three years prior. We’ve always had a great relationship with really open communication. He’s always been very thorough answering questions and as a father very compassionate and understanding of whatever concerns I had. I would still recommend him! ok, I’ll stop! This isn’t a YELP ad. Something about me going in “self-diagnosed” irked him and his nurse, and the conversation went south. I’m choosing to give grace, understanding that maybe they were just having a bad day. I knew something was up, though! My hormones were going crazy! I was breaking out like a teenage girl. I had strange abdominal bloating and cramping. My appetite was changing. I’m still breastfeeding. I never started my “monthly cycle” after having the munchkin (sorry for the details, but its true). According to the doctor I can’t be ovulating. AND…the pregnancy test said, negative. 10 weeks!! Due 12/3/14!! 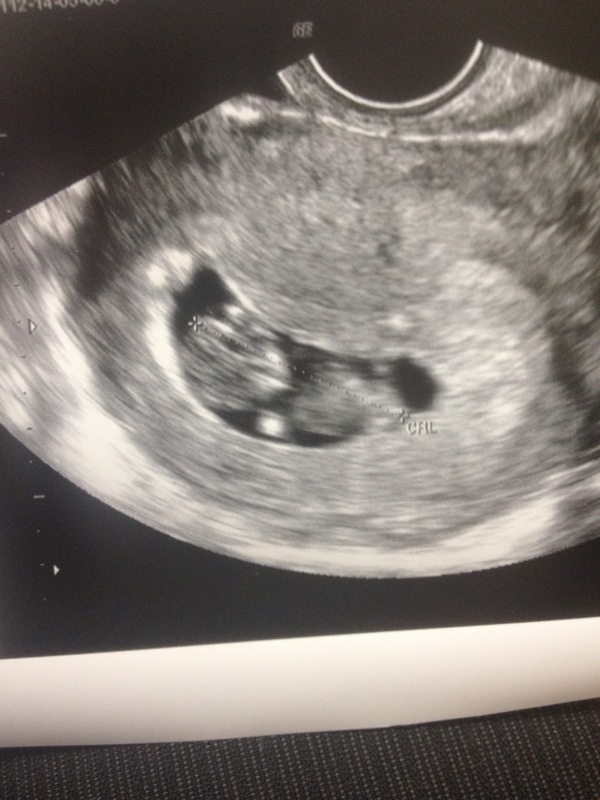 There’s the little peanut right there!! Yes, if you’re wondering, that’s ONE week before my munchkin’s 2nd birthday!!! 10 weeks!! This means I was just under 2 weeks pregnant when I saw my doctor and a couple days pregnant when I actually called to make the appointment. My doctor apparently didn’t do “everything”. He should’ve given me a blood test to check, but didn’t. He relied on my 99 Cent Store negative test result (which, by the way, was also the one that showed positive a month later) rather than my instincts. He did an ultrasound, but I have since found out, and you should note this, you can’t see the baby until almost 4 weeks. So how did I finally find out? A few weeks after my doctor visit I was still feeling off. My clothes weren’t fitting the same, smells started to get weird, and what did it for me was the coffee brewing Friday morning before work. I about lost it! The only thing that would remedy the nausea after that was a Cheesy Gordita Crunch from Taco Bell. Two all-too-familiar feelings from my first pregnancy!!! The moving truck was scheduled for pick up Saturday morning at 9:30. I was so excited for our new place and to start a new home for our family. I did not want to find out the night before our move. I wanted to just wait until we were settled in our cozy new apartment. Positive! it didn’t even need the full two minutes. It didn’t even need two seconds. Two lines immediately. God has a funny sense of humor! I was praying for a fresh start and new beginnings. He gave us a new adventure for sure! I love where we live. I’m just ready for this all day sickness to pass so I can make it more homey and be more present as a mom and wife. I am so thankful for my husband! We make a good team, but right now I feel like I’m stuck on the bench and he’s doing all the work. He is so gracious and so patient with me. Thank you Joseph! I love you so much! P.S. You’re Hott! Trust yourself! You know your body better than anyone. Trust God! His timing is better than your own. If you try to control your life too much, you’ll miss out on some incredible blessings He has for you. Or He’ll choose to bless you anyways to show you that you’re not in control! I’ve been on that end a few times too. Don’t forget to smile! Even on the hardest of days, a smile seems to make it a little brighter. 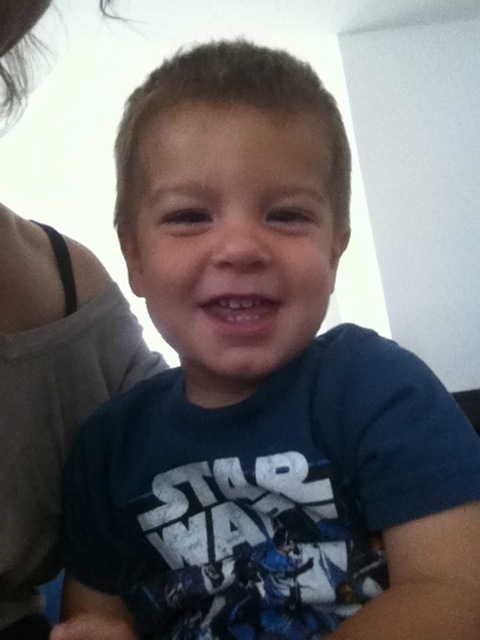 If you can’t get yourself to smile, look at this one, his always helps me!! I want to hear your thoughts and stories. Has your doctor ever been wrong about something? I had to find a new doctor since we moved: Should I call my previous doctor and tell him? This entry was posted in Faith, Family, healthy living, life's lessons, Miracles, Smile and tagged Babies are Miracles, Doctor Fail, God's timing, Mom of TWO, Pregnant, Trust God, Ultrasound by daniellekaz. Bookmark the permalink. So happy and excited for you, its amazing how people can still doubt a God that is so full of miracles!! I went through 3 doctors… that all told me my body could not carry to full term…and if i ever found myself pregnant again that i should expect a not so pleasant outcome. Although it wasn’t easy making it to 40 weeks and 2 days, i would do it all over again in a heartbeat…i did it and every time i look at my amazing blue eye cutie i know that God sent down a little piece of heaven for me to watch over and protect. What an amazing God we serve! HAPPY MOTHERS DAY DANIELLE and congratulations!! !